Documentary on the making of the low-budget 1970's drive-in cult classics Axe (1974) and Date with a Kidnapper (1976). Severin and David Gregory has come thru once again delivering a terrific documentary that gives you a wonderful idea of what it was like to make a low-budget movie back in the day. Director Frederick R. Friedel gets 61 minutes to look at his AXE and KIDNAPPED COED, two drive-in exploitation movies from the 70s. Friedel is joined by make-up artist Worth Keeter, assistant Richard Helms and production manager Phil Smoot as well as author Stephen Thrower as we really learn just about everything you'd want to know about these two films. We start off with AXE and the director talking about how he ended up getting the $25,000 to film it. From here we learn about the casting, the shooting and of course the eventual release. From here we go on to KIDNAPPED COED and again cover the various stages of production. What makes this film so great is that we really do get a great idea of what it was like not only to make an exploitation movie back in the day but also the heartbreak of having your films stolen from you. One of the greatest moments in the film deals with Harry Novak pretty much stealing the movies and doing what he wanted with them, which of course meant not giving any money to the filmmaker. This story as well as the tragic aftermath of the movies is something we just don't normally hear about. It was really a lot of fun getting to see the men back together discussing the movie, sharing stories as well as showing some of the locations and how they look now. 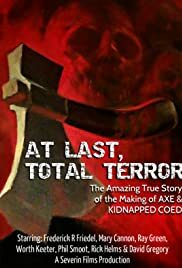 Even if you don't care about AXE or KIDNAPPED COED, this documentary is certainly a must-see for fans of exploitation or low-budget filmmaking.